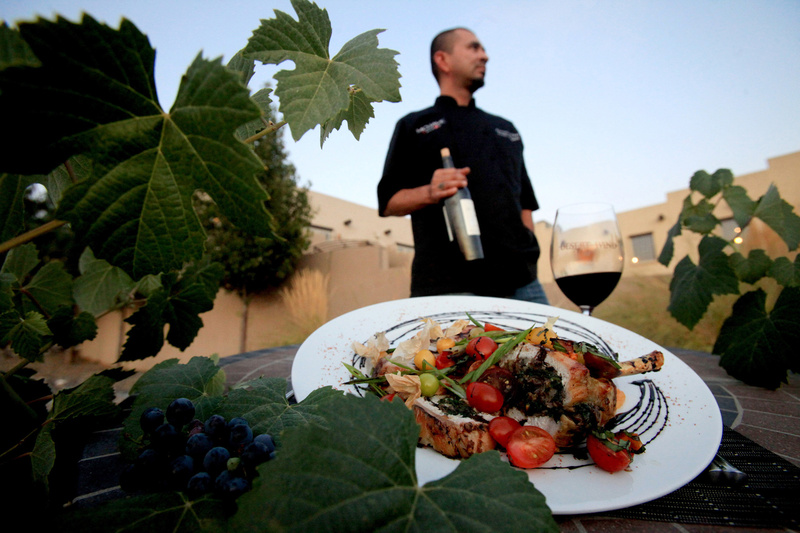 Chef Frank Magana at the Desert Wind Winery’s Supper Club in Prosser, Wash., where cooking classes are on the menu. If you can’t catch a farmers market, Yakima Valley has many fruit stands and U-pick farms. Find a map and directory at www.visityakima.com/farmfresh/farmMap.asp. Recipes and resources: Some wineries still offer Wine Yakima Valley’s recipe cards with wine-and-food pairing ideas ($15), or they can be ordered through the organization’s website, wineyakimavalley.org (click on “Wine and Food Summer”). The site also offers a calendar of upcoming food-and-wine events. PROSSER, Wash. – An adventurous crowd of foodies surrounded me at the Desert Wind Winery’s long dining table. As we started in on the fried green tomatoes, we noticed a garnish nobody recognized: what looked like little yellow cherries topped by tiny corn-husk winglets. The little wings were swept back as if part of our salad course was ready to join the kestrels soaring over the nearby Horse Heaven Hills. Was that husk edible or not? Should we ask? “I already ate mine,” confided Sheila, a Seattleite sitting next to me. OK, I confess: I had, too, washing it down with the suggested wine, a crisp Wahluke Slope sauvignon blanc. The husk was, uh, crunchy. “These are what we call ground cherries,” announced our host, Chef Frank Magana. “They grow on a bush like a tomatillo. This was Desert Wind’s monthly, anyone-is-welcome Supper Club, and it served to spotlight a big trend in wine-country tourism: helping visitors enjoy wine together with local food. The Yakima River’s fertile valley and surrounding sun-toasted hills, the birthplace of Washington’s wine industry – still producing nearly half the state’s wine – is the perfect venue for uniting local wines with the abundance of fresh vegetables, tree fruits, meats and cheeses that come from just up the road. Yakima Valley winemakers capitalized on the trend this summer, publishing a deck of recipe cards on which 34 wineries matched one of their wines with a favorite recipe, often from the family running the winery. For example, Fries Family Apple Cake is paired with the family’s Desert Wind riesling. Wineries took turns in July and August offering tastes of their featured dish and wine to tasting-room guests. It’s the kind of thing you can expect more of here. “For us it was a good choice, because while there are lots of great winemaking areas in the state, the valley has so much bounty (of food) as well,” says Barbara Glover, director of Wine Yakima Valley, an association of winemakers and grape growers. I sampled the featured recipes at Prosser’s Vintner’s Village, a one-stop wine lover’s haven just off Interstate 82 that’s home to 10 modern tasting rooms plus a wine-and-food bar called Wine O’Clock. Milbrandt Vineyards served baba ghanoush, a smoky eggplant spread on toasted pita bread, paired with ruby-red grenache. Gamache Vintners offered a playful peach and riesling smoothie, made from peaches grown next to their vineyard. Promoting the wares of farming neighbors came easily for winery folks such as Tara Divers, tasting-room manager at Milbrandt. For some of that eggplant, head for Prosser’s Saturday farmers market, where you’ll also find sweet peaches that spritz your chin with juice and peppers in colors you never knew peppers came in (like purple). And you can meet Buggirl. Insects of all kinds fascinated Stacey Gingras as a child, thus the name of her business, Buggirl’s Garden. The Prosser native is a regular vendor at the market, and also delivers produce to local wineries and restaurants. Besides Milbrandt’s eggplant, she provided the green tomatoes and ground cherries for our Desert Wind dinner. The ideas flow both ways. Winemaker’s dinners, with those adventurous diners, are perfect for the occasional novelty produce that Gingras likes to mix with the standards such as green beans or squash. Those efforts are bringing repeat customers, such as Joe and Shari Neuenschwander, of Issaquah, Wash., who came to the Desert Wind Supper Club last month for their third time since summer 2010. Along with the tomatoes, August’s three-course meal included a stuffed pork chop paired with Barbera red, and poached peaches with a late-harvest (sweeter) gewurtztraminer. Such variety stretches the couple’s wine knowledge, Joe Neuenschwander said. Why spend getaway weekends pursuing the perfect food-and-wine pairing? Devotees will tell you there’s a sweet spot that’s worth the quest. “For example, if you get a good pinot and have just the right glaze on duck, everything tastes better,” Neuenschwander said. Plus, when you’re out driving around the Yakima Valley with the windows down, you’ll revel in some pretty sweet views of Mount Adams and Mount Rainier from country roads lined by vineyards, orchards and hop vines. Only one whispered complaint around the Supper Club table among diners from the wet side of the mountains: Green tomatoes? We had more than enough of those on our own side of the state this year, thanks. Then again, now we know what to do with them. And what wine to serve.